At the time of my last report 7 weeks ago pig price was in the low 80’s Roubles per live kg. At that level some producers are losing money. At a result, imports of pigmeat from Brazil were stopped. Today the pig price is back up at 105 Roubles ($1.66) /kg live-weight. Producers are again profitable and good producers are making well over $50 per pig profit. Russia is facing some dilemma’s with regards to its pig industry! At today’s level of domestic pork consumption, it is nearing self-sufficiency. For sure, globally the highest pig price is in the country’s that are not self-sufficient. For Russian pig producers, Russia remaining a net importer of pigmeat will keep prices and therefore profitability higher. For Russian consumers pigmeat will remain relatively expensive. On the flip side, the world has an expanding population that needs food. Russia is very well placed to supply a lot of the food required for this growing population. There is a lot of underutilised land to grow more crops and to produce more pigs. Products can be shipped to the market over land (quickly). There is huge potential to increase productivity rates per worker, meaning there is a large available workforce. Becoming a major exporter is good for balance of payments for the country as a whole, so long as exporting is profitable (it makes no sense subsidising exports – to support local industry). For this to happen continued expansion is required. This will inevitably lead to situations where supply can be greater than demand – which always means lower sales price (usually lower than the cost of production). As someone who has worked and travelled around Russia for the past 12 years, I see only a country with massive potential in terms of continually developing pig production. For pigs you need land, grain and a skilled workforce. Russia has all in abundance! For growth to continue, pig production needs to remain profitable!! Subsidies were good for kick starting the pig revolution, but subsidies do not encourage efficiency and low cost. That comes from competition. Russia can be a low cost producer of pigmeat. Many of the major inputs in Russia are low cost. Feed raw materials, labour and utilities. Other costs are very high. Russian farmers need some help from government with some of these costs. What can be done to help the Russian pig industry to continue to expand, reduce costs and export? This is a cost to the industry and restricts the ability for Russia to export. The 2 problems are domestic production and wild boars! It seems making domestic production illegal is a problem, but simply putting the same bio-security and pig movement rules in place for all places where pigs are kept is more simple. This will make keeping pigs at home rather expensive! The solution for the wild boar population is hunting and removing wild boar from infected areas (there really is no other solution today). Wild pigs can be re-introduced from populations without ASF at some future date, maintaining the valuable natural environment. This will drive demand for both increased domestic consumption and export. Russian’s like fatter cuts of pork and for export (to Asia) the requirement is for darker meat with more marbling. However the grading system today penalises fat and takes no account at all of colour or marbling. A revised grading system along the lines of the one proposed by the USDA in USA seems much more relevant in Russia for increasing pig meat consumption. This grading systems pays more for darker meat with higher marbling and less for pale, dry very lean pigmeat. It is a fairly basic rule of marketing to produce products consumers want to buy and at a price they are happy to pay! Pig meat consumption in Russia is well below the level of other East European countries. This is of course in part due to lower average salaries. I am convinced if Russians could afford to eat more pork they would – there is potential to double consumption!! Russia is a very administrative country. I have seen administration costs on farms as high as $9.00 per slaughter pig Vs $1.00 in the USA (where administrators salaries are higher). Of course reduced administration requires many law changes and also some in traditions. I am sure that much administration is done – ‘because it’s always been done that way’!!! There are many areas where simplifying the administrative process would not reduce level of control (in my experience it would actually increase control). Currently loans have to be repaid within 8 years. Although loan repayment is not actually a cost in true accounting terms, it is a large demand on cash for producers who have invested heavily in new farms. Capital repayments can be between $20 and $30 per pig for many farms. The highest I have seen is $50 per pig!! Having capital repayments over the 15 year normal life of a new building greatly reduces this demand on cash. I was always taught, that if you change nothing then nothing will change. I was also taught that in business if you stand still (change nothing), you are in reality going slowly bankrupt. Put these two together and you understand you have to be continually changing and developing. 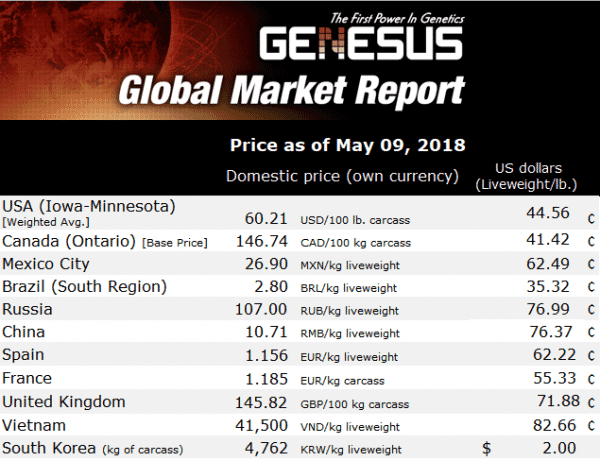 Genesus, as a global genetic supplier has to be continually changing and getting better year on year on year to remain in business and remain profitable. You need only look at the list of breeding companies that have been represented in Russia over the past 10 years that have disappeared / merged or been taken over. Hermitage, JSR, ACMC, France Hybrid, Gene+, Penarlan, Genetiporc, to name but a few! Of course humans resist change and it’s true that change can make things worse. It is also true that with change there are winners and losers! What is the truest of all is that with no change we are all losers!